Backstage pass for a Blondie appearance at Santa Monica Civic in November 1978. "The Greg Kihn Band" written in pen. Moderate wear. April 1982 ticket for a slamfest in Torrance. A really great li'l time capsule...an original ticket stub from a June 1982 stop in Austin and an anti-Clash flier handed out by disgruntled Austin punks before the show! Impossibly rare complete, unused ticket for a gig in Worcester, Massachusetts in September 1979. The ticket has some creasing, and the hinge is very delicate but nevertheless intact. This is one of only two examples I've seen of this ticket (the other came from the same collection and is split along the weak hinge). A fine Wormtown artifact! 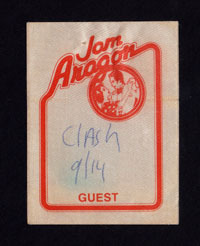 Never-used (backing still intact) backstage pass for this September 1979 Clash stop in Chicago. April 1981 ticket stub for this LA gig at the Roxy. Roxy advance sale tickets are uniform on front and are either rubberstamped or printed with the gig info on reverse (see pic). The Damned take Reseda in June 1983. Right side hinge is weak but hanging on. First ticket issued! See pic. Used but mostly complete stub for this July 1978 appearance in Chicago. March 1980 ticket stub for a trip down to LA. Whisky advance sale tickets are uniform on front and either rubberstamped or printed with the gig info on reverse (see pic). Ticket stub for a Devo show in Tempe, Arizona in November 1978. Unused, full ticket for this Seattle show in January 1979. Ticket stub for a big Devo show in Houston, November 1981. Stub for this July 1979 appearance in LA. Dig the sparkly thermography! Ticket stub for this December 1978 Devo stop in Pennsylvania. Unused backstage pass for a Devo stop in Dallas in August 1979. One small corner has come off but otherwise Fasson brand backing is intact. Full ticket for this February 1979 show in Long Beach. Crease at center and hole punch on right side. Early 80's drink ticket for Chicago's legendary Exit venue. Specials printed on reverse including penny drinks for the ladies on Tuesdays. Ticket stub for this July 1981 gig in Los Angeles. Grievous bodily harm ensues on August 1983 thanks to Goldenvoice. 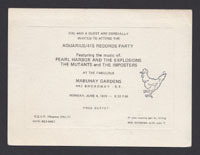 June 1981 ticket stub for a local LA gig. Roxy advance sale tickets are uniform on front and are either rubberstamped or printed with the gig info on reverse (see pic). 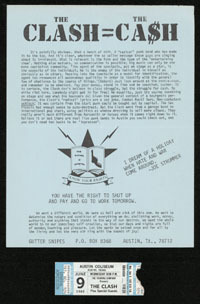 Unusued ticket for the Ig in Austin in November 1977! 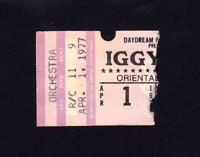 Ticket stub for an Iggy stop in Tempe, Arizona in December 1979. Stub for this April 1977 stop in Milwaukee. Ticket stub for a March 1977 NYC gig. Ticket stub for another Iggy stop in Austin, Texas, this time in February 1980. Backstage pass for this March 1980 stop in Chicago. Ticket stub for a June 1981 stop in Los Angeles. Whisky advance sale tickets are uniform on front and either rubberstamped or printed with the gig info on reverse (see pic). Ticket stub for this October 1983 UK show with Jayne County. Date and "Jayne County opened" written on pencil on back. Unused ticket for this August 1979 Troubadour line-up. April 1975 ticket for the Memphis stop on their first US tour! Some creasing but mostly visible on the blank back side. Ticket stub for this August 1979 rockabilly romp. Whisky advance sale tickets are uniform on front and either rubberstamped or printed with the gig info on reverse (see pic). Stub for this April 1978 appearance in Chicago. Ticket stub for a Seattle two-fer line-up in August 1980. May 1980 ticket stub for this LA gig. Roxy advance sale tickets are uniform on front and are either rubberstamped or printed with the gig info on reverse (see pic). Used but largley intact stub for this April 1978 appearance in Chicago. May 1978 ticket stub for a Patti stop in LA. Scarce unused concert pass for this July 1979 gig in Santa Cruz. Orange ink staining in lower left corner. Measures 3½" x 5½". Brown MACback backing. Ticket stub for her May 1979 stop in Boston. 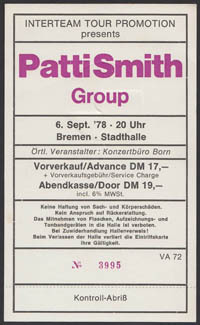 Unused ticket for this September 1978 stop in Germany. August 1979 ticket stub for a trip down to LA. Whisky advance sale tickets are uniform on front and either rubberstamped or printed with the gig info on reverse (see pic). Unused July 1978 Starwood ticket. Tape pull tear on back. Ticket stub for a March 1979 stop in Los Angeles. Whisky advance sale tickets are uniform on front and either rubberstamped or printed with the gig info on reverse (see pic). Ticket stub for this October 1980 gig in LA. Whisky advance sale tickets are uniform on front and either rubberstamped or printed with the gig info on reverse (see pic). Ticket stub for this March 1978 Ramones stop in Cincinnati. Complete, unused ticket for a Ramones swing through Manchester in September 1978. 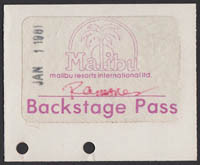 Original January 1981 backstage pass for a New Year's Day gig at the Malibu Resorts. Bizarre! Pass was used by the original owner and then stuck to file card. Backstage pass from an August 1980 Ramones 'n' Rattlers. 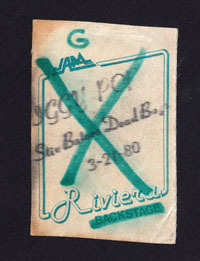 Original backing gone and now stuck to a piece of notebook paper with "8/8/80 Mine!" written on it. October 1982 ticket stub for this LA gig at the Roxy. Roxy advance sale tickets are uniform on front and are either rubberstamped or printed with the gig info on reverse (see pic). Circa late 70's unused Roxy ticket. No markings to indicate which gig this one's for. LA punk rockers were most displeased with the $6.50 cover charge for this May 1979 show! This ticket stub was originally glued into a scrapbook of which there are some remnants on back (see pic). A rare one indeed! Completed, unused ticket for this insane May 1978 Detroit line-up! Completed, unused ticket for this tasty July 1978 line-up with some Canucks comin' south for a show in Detroit rock city. Full, unused ticket for this November 1978 stop in LA. Small, hard-to-see tackhole through center. May 1981 ticket stub for this Whisky-A-Go-Go gig. March 1979 stop in LA! Whisky advance sale tickets are uniform on front and either rubberstamped or printed with the gig info on reverse (see pic). Tape pull on front. April 1981 ticket stub. Roxy advance sale tickets are uniform on front and are either rubberstamped or printed with the gig info on reverse (see pic). Unused ticket for this March 1980 line-up in Culver City. Unused ticket for this November 1979 Troubadour line-up.